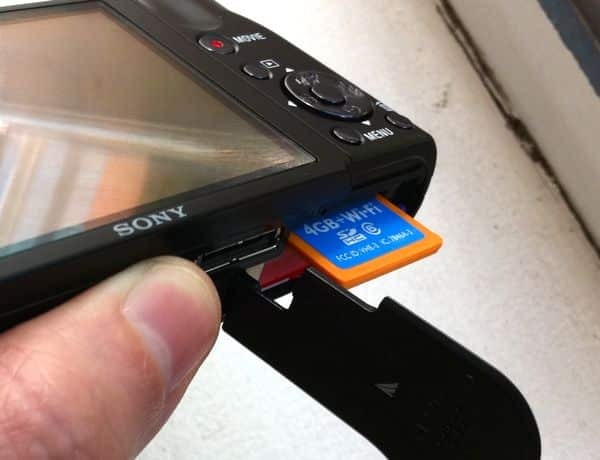 The idea behind the Eye-Fi memory card is simple. 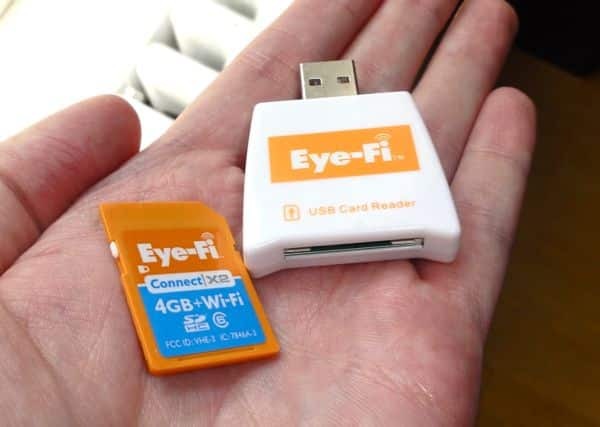 Equipped with its own little Wi-Fi antenna, the Eye-Fi replaces the SD (short for “Secure Digital”) memory card that sits in your digital camera, and then connects to a nearby Wi-Fi network and wirelessly sends any pictures or videos you shoot to your PC or Mac. While it’s a clever concept, the Eye-Fi itself isn’t all that new; indeed, the first Eye-Fi cards landed in stores about four years ago. But for a variety of reasons, I never quite ended up getting an Eye-Fi card for myself—namely because I figured it would be too pricey, or too much of a bother to set up. But having finally grown tired of continually prying the memory card out of my Sony digital camera, sliding it into a USB memory card reader (which, by the way, I usually have to fish out of a cluttered desk drawer), and plugging the thing into my iMac, I decided to break down and buy my very first Eye-Fi card—to my surprise, just $49 (for the cheapest 4 GB version). Setup couldn’t be simpler. After tearing open the Eye-Fi box, I found the little memory card sitting in a small USB dongle; as per the instructions, I plugged the dongle into my iMac, and within seconds I’d installed the Eye-Fi desktop software. The Eye-Fi's easy-to-use desktop software. The on-screen setup instructions then stepped me through the process of setting up an online Eye-Fi account (only your email address and a password are required), connecting the Eye-Fi card to my home Wi-Fi network (the software automatically detected my Wi-Fi router, asking only for my network password), designating where I’d like my new photos deposited on my hard drive (you can select any directory you wish, or send pictures directly to a photo management app like iPhoto), and picking which, if any, online photo sharing services you’d like to enable (including Flickr, Apple’s MobileMe, Google’s Picasa, and Facebook). Once I’d finished with the setup process (which took all of about five minutes), I replaced the memory card in my Sony camera with the Eye-Fi and squeezed off a few test photos—and within seconds, the snapshots began popping up on my hard drive, no card-swapping required. Nice. Of course, you’re not always going to be in range of your home Wi-Fi network, which is why the Eye-Fi card will let you transfer your photos directly to an iPhone, iPad, or Android smartphone. 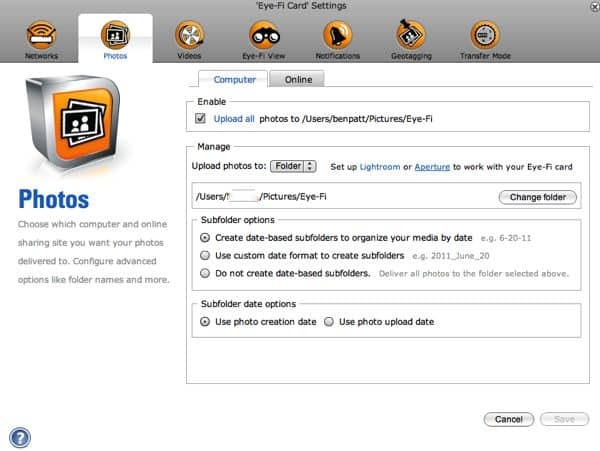 All you need to do is install the free Eye-Fi app for iOS or Android onto your handset, and then configure the Eye-Fi to send snapshots directly to your phone’s photo roll—and from there, you’ll be able to view, email, and otherwise share your latest pictures within a few minutes or seconds. Just insert the Eye-Fi into your camera's SD memory slot and start snapping away. Another nifty feature is called “Endless Memory,” which automatically deletes old photos off the Eye-Fi once it’s filled to a set capacity, and only after a given picture has been uploaded to your PC—meaning you’d never have to worry about the Eye-Fi running out of storage space. So, will the Eye-Fi put a strain on your camera’s battery? No, says the card’s manufacturer, which claims that the Eye-Fi’s “advanced power management” system will “optimize” battery use. That said, I’ve noticed the battery meter on my Sony DSC-HX5 quickly drain during my limited testing Monday, although that could simply be a issue with the aging battery I’m using. Last but not least: What if something goes wrong with the Eye-Fi’s Wi-Fi connection? Will your photos be trapped in your camera? Well, no—or at least not if you save the USB dongle that comes with the Eye-Fi. If all else fails, just take the Eye-Fi out of your camera, put it in the USB dongle, insert the dongle into your PC’s USB port, and drag and drop your snapshots as you’d ordinarily do. Have questions about the Eye-Fi? Let me know!